Join us! At NHBSR we strive to give our members the most innovative tools possible to help businesses meet their objectives. Our members are proving that profitability and social responsibility are not only compatible but necessary for the long-term health of our economy, our environment and our people. 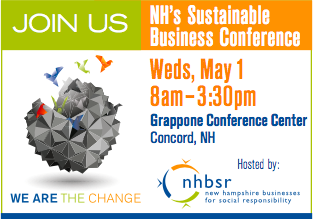 Your NHBSR membership dollars make it possible for our organization to bring important new business voices and concepts to the New Hampshire business community, and to cultivate a new business climate that recognizes that long-term, sustainable profitability is directly related to operating in a socially responsible and ethical manner.